Last school year, her classroom was made up of little third graders, every one of which came from either a single parent family, or a dysfunctional family, was undernourished and/or uncared for, lived in an abusive home and was either beaten, bruised, or raped by other family members; one little girl’s dad died of aids, and the list goes on. Her heart bled for these kids. away when Andrew motioned with his little forefinger for her to come closer. He whispered to her, asking if she believed in angels. She told him yes, she did. Then he asked her if she thought people could see angels, and she said she thought some people probably could. 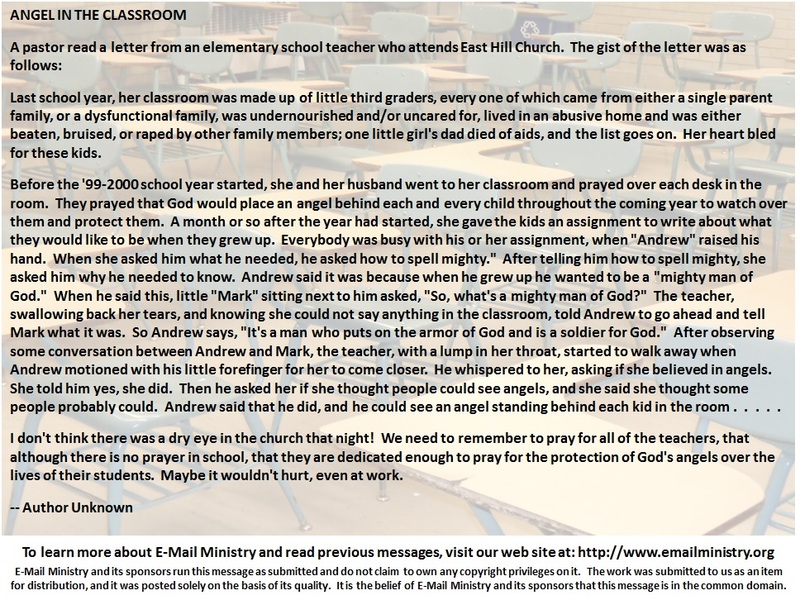 Andrew said that he did, and he could see an angel standing behind each kid in the room . . . . . . I don’t think there was a dry eye in the church that night! We need to remember to pray for all of the teachers, that although there is no prayer in school, that they are dedicated enough to pray for the protection of God’s angels over the lives of their students. Maybe it wouldn’t hurt, even at work.